Car news. The exhibition event of Thailand International Motor Expo 2014, held in Bangkok became prime opportunity for Honda to show Honda CR-V facelift version of ASEAN. Predicted only in a few months already present in the ground water. In Thailand, as reported by indianautosblog today (29/11) Honda featuring New Honda CR-V and the version of the Honda CR-V Modulo. 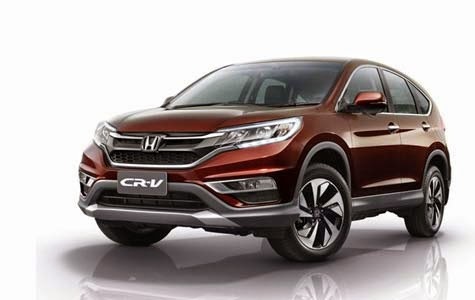 Honda CR-V gets small revisions to the integrated headlights with LED daytime running light and adopts grille and bumper with the latest design more solid. Rear spoiler rim design also changed. Even so with the tailgate chrome accents make a classy appearance on the All New Honda CR-V did not decaying inedible new design. For the ASEAN market, reportedly will be provided three-reverse parking camera with wide view angle. Also the head unit that is now carrying the 7-inch touch screen and the latest features lane assist system. So also with the engine, the engine choice is available with a 2.0 liter 4-cylinder i-VTEC engine and engine capacity of 2.4 liter i-VTEC. And two diesel engine options, a 1.6-liter i-DTEC and 2.2-liter i-DTEC.